Sorry but this opportunity is for ESP members only. Join ESP HERE. Following a successful Crit Club #1 earlier this year, ESP members can now sign up to be part of the next season of Crit Club, to discuss new and in-progress work. These sessions are ideal for those who want to hear critical feedback about works in development, and in turn want to contribute to generous and useful conversations about the work of other ESP’ers. Crit Clubs involve up to eight ESP members, who will each present work for discussion by the rest of the group. To create a supportive, focused and critical forum, Crit Club participants will be joined by ESP Programmer and a guest professional. We want to give members the opportunity to understand each other’s practices in depth, and to provide input as work progresses, so this next season of Crit Club will take place over seven months, and you will need to be able to commit to attending all sessions. All participants bring work for group discussion and feedback. This full day session will consist of short presentations from members to introduce their work and outline the most urgent areas to look at during Crit Club sessions, followed by group critique. A group away day to visit an artist studio group in another city. Talk to more established artists in their studios and hear how they talk about their work. Half the group present work on Monday evening and half on Tuesday, with the whole group contributing to discussions on both nights. See how work has developed since the first meeting in these substantial conversations. Following the same structure as the October session it’s an opportunity to talk about new works as they develop and get feedback from the group who now have an understanding of each other’s practices and the issues that are being worked through. To wrap up this series of Crit Club every member of the group offers work for quick fire crits, to reflect on how work as developed and think about next steps. This session is also open to ESP’ers joining Crit Club season #3. 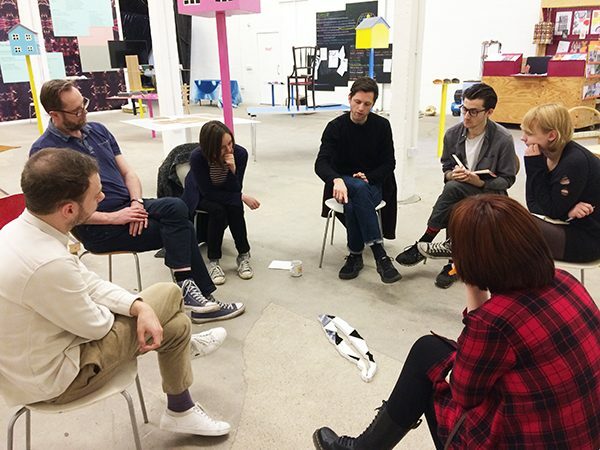 Sessions will usually take place at Eastside Projects, but it might be possible to host a Crit Club at your studio if you prefer. Let us know if this is the case. To register your interest in joining Crit Club, email an outline of the work that you’d like to discuss at the first session, along with up to three images (if applicable) to submissions@eastsideprojects.org by Tuesday 4 July.